Cairns are found all over the world, and have different spiritual meanings and historical purposes. When a large rock is placed on top of smaller rocks the cairn is fondly referred to as a "duck cairn" and it's purpose is to show the way at a turn in the trail. The second year of an annual backpacking trip with my sister-in-law was one I won't ever forget. After a whirlwind of juggling kids, activities, work, and musical performances I was ready for the sound of silence that only the mountains can provide. We thought we had our trip organized, but the plan kept changing. A series of unfortunate events forced us to make a quick decision about where we were going the night before we left, leaving us scrambling to gather the necessary belongings the morning of the trip. It didn't help that I left a pile of intended clothes back home on the couch that never made it into my bag in my whirlwind to leave my house. My sister-in-law is a planner. She likes to have her duck cairns pointing her in the right direction. I, on the other hand, am used to being a bit more spontaneous and have always had the habit of doing things more last minute…..call it a rock slide, if you will. 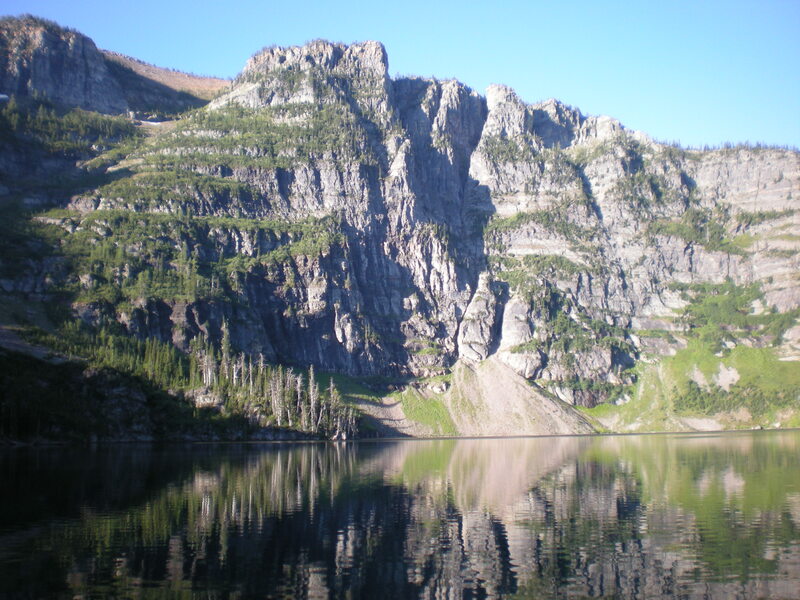 Our final decision was to head into the Cabinet Mountain Wilderness southwest of Libby, MT. 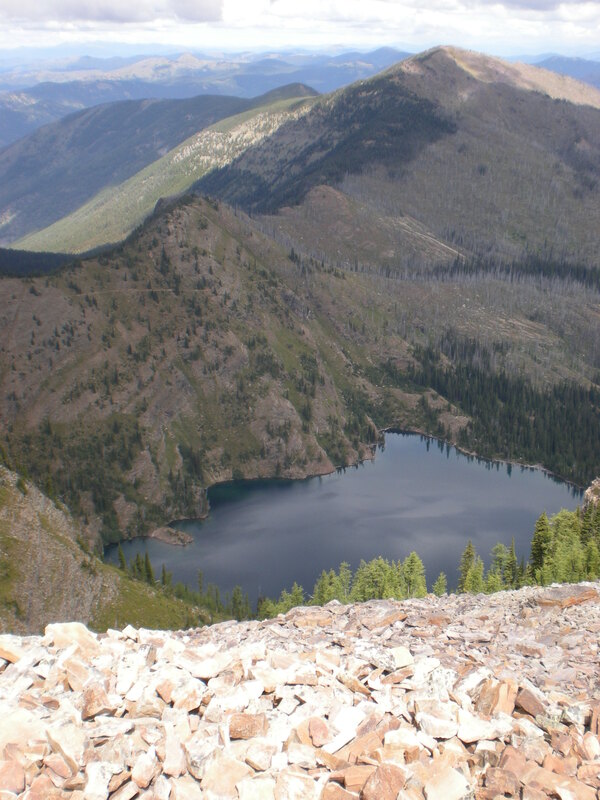 We would hike 5.5 miles to Cedar Lake and ascend Dome Mountain the next day. We prepared for wet weather and started our climb through the thick forest with lush vegetation and Cedar creek flowing abundantly next to the trail. The hike was beautiful but grueling. The elevation gain was steady, and I had packed my bag haphazardly. 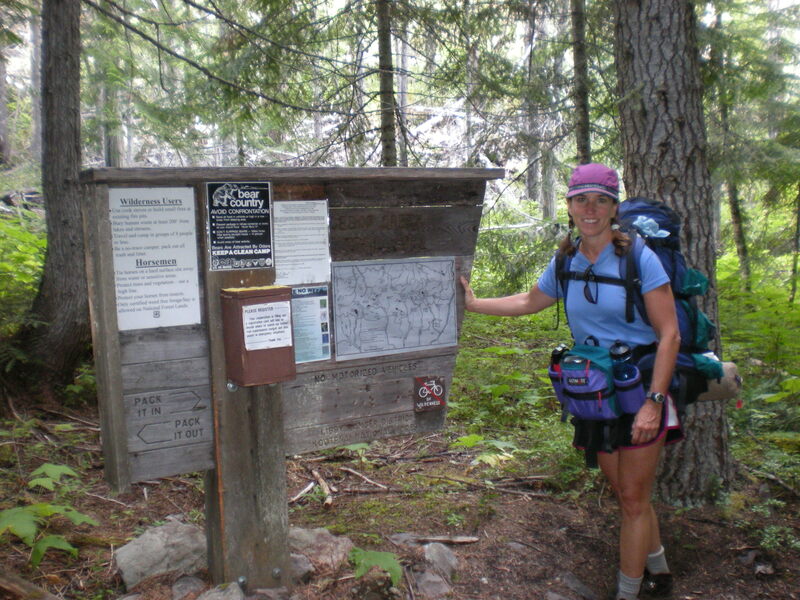 Mona was hiking along without a problem, being the planner who loaded her belongings in a much more organized way! We had beautiful weather….partly sunny but cool with the shade of the clouds and cedar canopies. A nice surprise along the path were amazing huckleberry patches that were in their prime. We made our final ascent to the lower Cedar Lake and took a minute to take in the view and take a rest, then headed up toward upper Cedar Lake. We no sooner had found our perfect camp site and set up the tent when the sky opened up and a steady downpour of rain followed. We ducked into the tent, popped open a beverage and enjoyed the safety of our dry shelter while having conversation that was not being interrupted by children. The rain and conversation washed away any residual stress that remained before our quick break away from reality. We both soon felt refreshed and excited for our hike the next day. The weather gods smiled upon us, leaving us with a beautiful aroma in our luxury retreat for the night, and enough break in the weather to get a fire going to cook up some dinner. No fish this year, and our little mountain goat from last year's trip was fondly missed. However, after an amazing lightning and thunder-storm during the night (which Mo slept right through) our one and only wildlife friend of the trip made his appearance at approximately 7:45 am the next morning. An obnoxious squirrel, who situated himself on a tree limb right above our tent was chirping more fervently than any cuckoo clock I have ever heard. Later, we thanked him. We lazily made our way out of our tent and were blown away by the beauty of the blue sky reflecting on crystal blue Cedar Lake with Dome Mountain beckoning us to her peak. We ate a good breakfast, packed a day bag, and headed up the trail, which took us away from the lake and through diverse landscapes. The various wildflowers scented the mountain air and birds serenaded our efforts. The trail was good desensitization for anyone afraid of heights (aka: ME on occasion) as it hugged the mountainside and forced us to pay attention to every step we were taking. It was easy to be distracted by the view as we climbed further and further up in elevation and were able to see peaks and mountain ranges for miles. We hesitated at a fork in the road that wasn't well-marked and continued on, later to learn we had gone off track, extending our trip another couple of miles, but worth the beautiful view we received from a different vantage point. Another spontaneous gift! 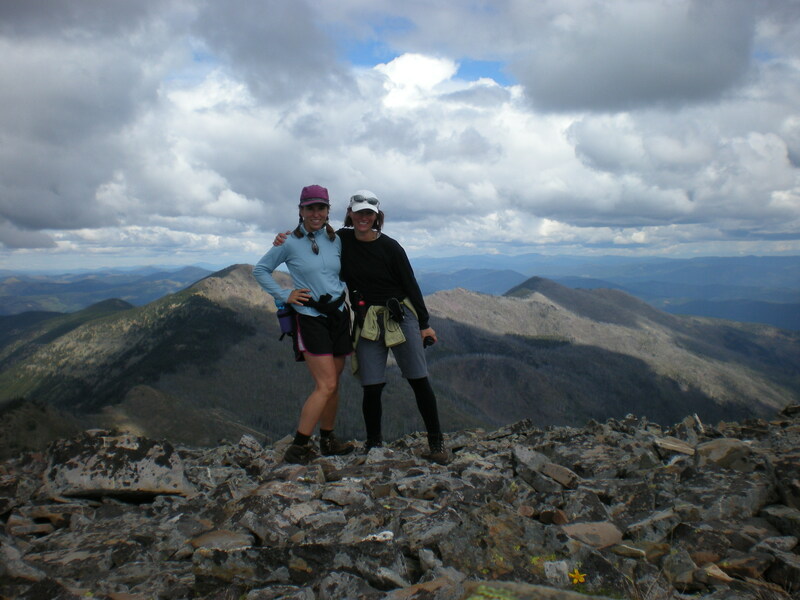 After backtracking we found ourselves near summit where the last ascent was rugged terrain of rock piles. It took some fancy footwork and concentration to stay balanced but seeing the end in sight was great motivation. After taking in the view from every angle we realized we didn't see Cedar Lake. 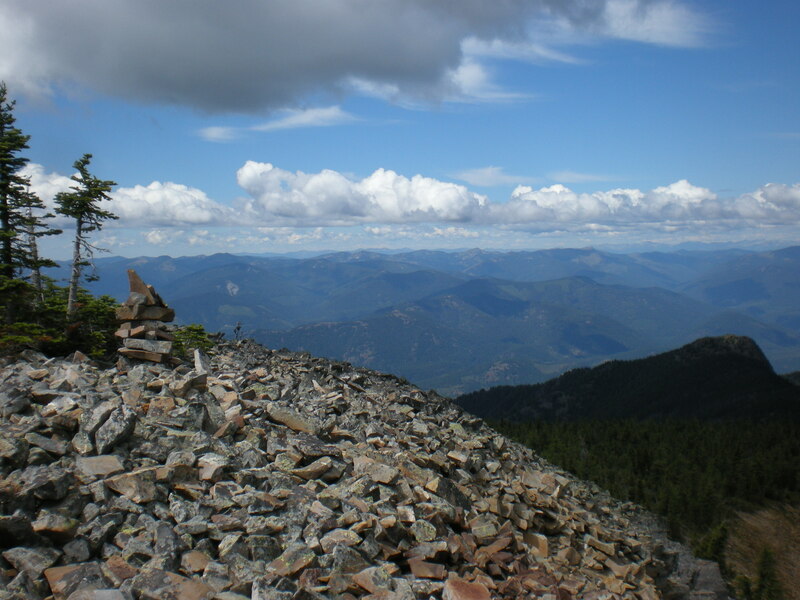 Upon further observation and looking over at another summit we saw more rock cairns. More ridge hiking and rock dancing took place until we made it to yet another summit…..the elusive peak of Dome Mountain-finally! What a wonderful, quick, adventurous trip we had! After all the obstacles we encountered trying to make this trip come to fruition I believe Mona and I learned something about ourselves and each other. I sometimes do not plan enough, and preparation is important. She sometimes plans too much, and flexibility is important. 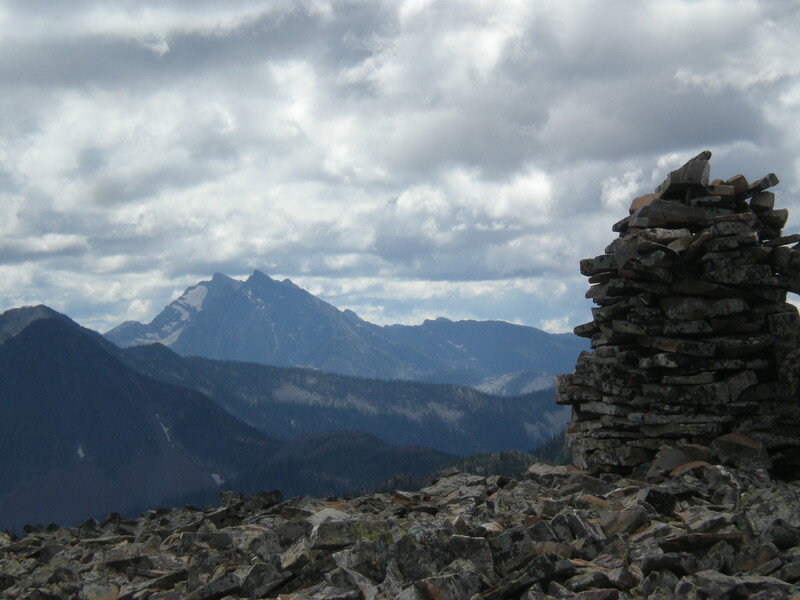 The rock cairns that were erected on both the peaks we reached were great reminders of life and balance. Each rock represents events in our life. Some are weathered and sharp, some big and some small. The structure signifies the whole person, made up of all our events, thoughts, experiences, and even where we are heading. The exciting thing is that we have the power to take all those little pieces of our lives and shape them however we want! LIFE LESSON? 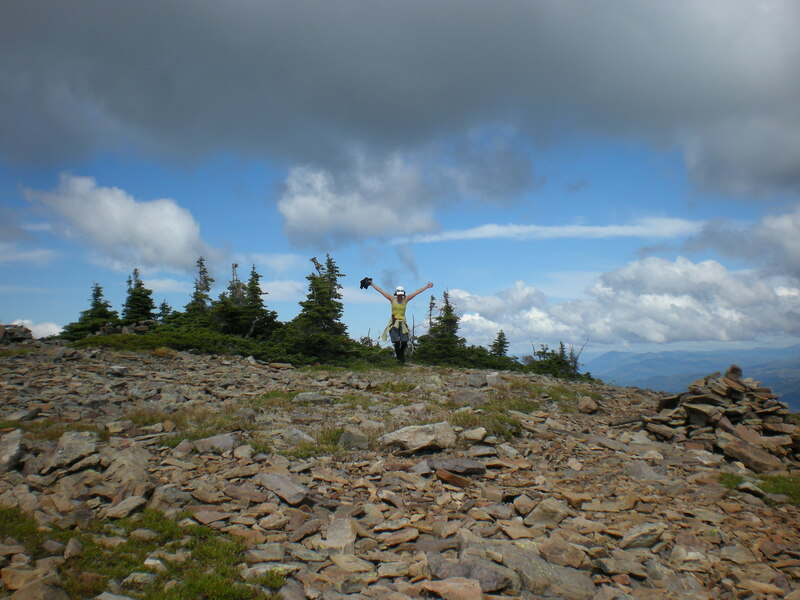 Embrace your rock cairn and enjoy the view! That’s quite an excursion with many a life lesson, Jen. Thanks for sharing. I love how you “dance” with each new challenge another rock cairn represented. True freedom to enjoy our hidden talents resides in a free mind and a soaring spirit. We have the power to exceed our wildest dreams when we mangage our successes so they come with more regularity and with greater outcomes than we imagined. “True freedom to enjoy our hidden talents resides in a free mind and a soaring spirit.” Wow. What a great quote!! Thank you for your contribution and thoughts here. I do love the way nature has so many analogies on living a life of our dreams. Thank you so much for stopping by, and for reading my article! I enjoyed both this post and the last one, both of which reminded me of my backpacking and hiking days in Montana and elsewhere. It’s so beautiful. My hikes these days are shorter and tamer, but I enjoy the tales vicariously, and the metaphors directly! Hi Galen! I would love to hear about your jaunts in Montana!! That is really neat. Thank you so much for stopping by, and I am glad you enjoyed the stories. I know my time will come when I have to pare back the hiking trips, but I hope to have a great journal of life lessons and stories in a book when that happens, so I can always remember the details of my favorite times spent in the wilderness!